Civil society is one of UN Women’s most important constituencies. It is a dynamic source of ideas and policy perspectives, partnerships, and support. Following its establishment in 2011, UN Women’s partnership with civil society has been strategic and innovative and aimed at strengthening political solidarity and feminist movement building. This relationship is founded on the principle of leaving no one behind and premised on the reality that women and girls suffer intersectional discrimination based on their gender, race, class, sexual identity, etc. Placing the progress of the most marginalized communities first is a critical component of this vision. Another component of this vision is the establishment of advisory groups at the global, regional, and national levels known as Civil Society Advisory Groups (CSAGs). The CSAGs serve as forums for dialogue and sustained engagement at all these levels. They keep UN Women grounded to the issues and constituencies that we serve. UN Women also supports civil society participation in a number of intergovernmental processes such as the Commission on the Status of Women and other major international conferences. Continued partnership with grass-roots women and youth has fostered their ongoing dialogue with key policymakers, ensuring that their voices are not left out of these crucial processes. 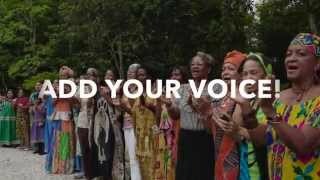 UN Women called for participation and contributions from civil society women’s groups in the lead-up to the Third International Conference on Financing for Development, Addis Ababa, Ethiopia, 13–16 July 2015.